Abigail, my four-legged kid, cracks me up at times. The things that she does naturally can be very amusing. What would be more amusing is sometimes those moments can be captured by the camera! Below are some delightful examples! Alright, deal the cards boys. I can bluff them, they are only guys. Think you can take my BoBo away from me? I woke up feelin' refreshed from the rain that fell over night. The rain washed off that thick yellow pollen down, giving all things in nature their fresh color again. 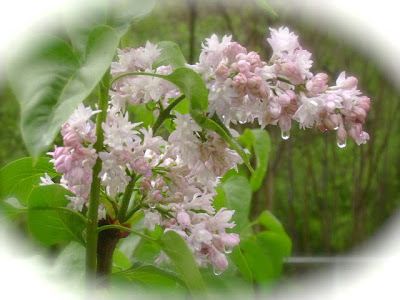 The scent of my Mother's Day Lilac seemed to have renewed! The memories that this treasure holds! Ten Years! I stand and admire the years it represent. My daughters, both of them, have done this Mom proud. Each new year I am newly awe'd of the women they have become. *** Luke 1:42 In a loud voice she exclaimed: " Blessed are you among women, and blessed is the child you will bear!". Some say that distraction is a bad thing. That it takes away your focus. In many ways I would agree, for an example... while driving, while cooking, while watching the youngsters, watching pets, reading and so much more. Those times are critical for undivided attention and focus to prevent serious harm. Then there are another kinds of distraction that are bad for you because they waste time of your productivity. T.V. and computers come to mind as far as that kind. I am guilty of those, but it does not monopolize me. As you can see, there are many distractions that are "bad". The making of Wild Violet Jellies! I did it! I made beautiful jellies! Yesterday evening I went out in my backyard with my apron and red gardening clogs on, armed with a basket lined with a tea towel that I made for myself. Abigail, my beagle kid joined me in my activity. 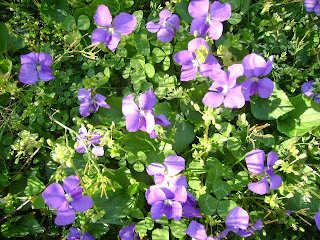 We sat ourselves down on the soft ground and began picking the wild violets. They are in abundance here! ... basketful of lil faces! ..gently rinse the beautiful purple beauties! ...let them steep in boiled water for a time. ...LOOK at that gorgeous color! ...jellies! Jars and jars of them! ...two jars just for Hubby and I! Here is the link to that wonderful recipe! 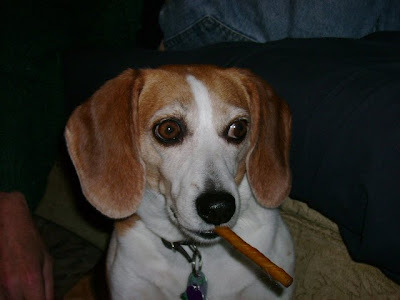 ..the time outside was good for me and my beagle, Abigail. Although, she insisted on helping herself to eat from my basket! We came to an understanding.. she picks her own (I showed her how) and eats her own! Abigail and I sure are!